Consider Microsoft's new Bluetooth Mobile Keyboard 6000 the Kate Moss of computer accessories: It's so thin, you may want to feed it a sandwich. The keyboard was developed to address the growing demand for portability, particularly among business users, and the spread of Bluetooth: According to an IMS Research forecast, 55 percent of notebook PCs will ship with Bluetooth by this time next year. The feather-light 6000 is just a few millimeters thicker than an AAA battery, making it the slimmest keyboard ever to emerge from the Redmond, Wash., brain trust. It's also supermodel-stylish, with a streamlined, tapered-down design created around Microsoft's wave-like Comfort Curve layout. No less notable, the Bluetooth Mobile Keyboard 6000 addresses the glaring absence of number pads on notebooks and netbooks by featuring a stand-alone Bluetooth Number Pad that can be used with the 6000 or by itself (it even boasts its own carrying case for added portability). 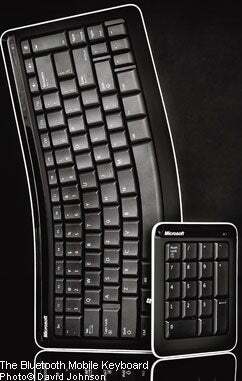 The Bluetooth Mobile Keyboard 6000 is $89.95. Microsoft is selling the Bluetooth Number Pad on its own for $44.95--in the event your accessories budget is a bit thin as well.